This Ready to Ship Table Skirt is In Stock Now! This Table Throw is Bright Red to Attract Attention! 100% polyester cloth is flame-retardant, brightly-colored & long-lasting. 30" wide runner will look great on 6 & 8-foot-wide tables. 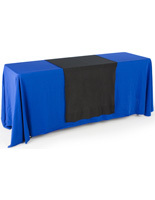 Blank table cloth lets you personalize your own presentation. 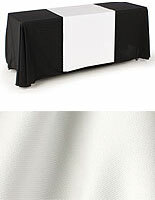 This inexpensive table skirt coverlet makes an otherwise average-looking trade show exhibit look extraordinary. The linen overlay, inexpensive table skirt coverlet is sold as is (no imprinting or text options), which gives you the opportunity to customize the tablecloth on your own. 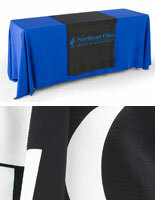 Use the table skirt coverlet as add color to an exhibit or add your company's logo or slogan for personalization. 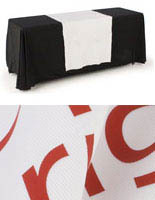 (We offer this inexpensive table skirt coverlet with custom, heat-transfer vinyl logos! Please view our related products for more details.) This inexpensive table skirt coverlet, also known as a table runner or table throw, is machine-washable and resists wrinkles. If it does wrinkle, just iron it! 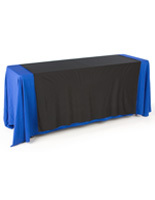 No worries about expensive dry cleaning with these cheap table skirts! 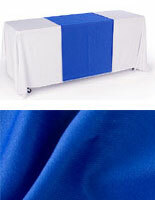 The table skirt coverlet is also flame-retardant, a typical requirement for convention centers and halls. 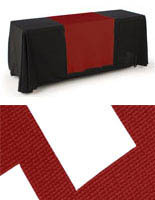 This inexpensive table skirt coverlet allows you to personalize a trade show table presentation! 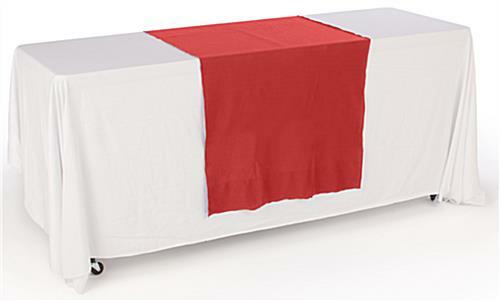 The tablecloth throw, inexpensive table skirt coverlet is a 30" wide rectangular red cloth that draws attention to your trade show display. The bright red fabric contracts strikingly with the standard blue or black table covers typically found in exhibition halls. This inexpensive table skirt coverlet, also called a tablecloth and table linen, is 80" long, guaranteeing a handsome drape on most standard-sized folding tables.